The assault happened on Saturday morning next to a Spar store in Inverness. A man was left with a serious facial injury after being assaulted outside a shop in Inverness. 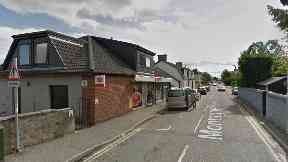 The attack happened at around 8.20am on Saturday close to the Spar on Montague Row. The 18-year-old and another man approached the store and became involved in a fight with a third. Police said the victim suffered a serious facial injury and required hospital treatment. Officers are looking to speak to a man in his late teens or early 20s, around 5ft 9in tall with a stocky build and dark hair. He was wearing a dark grey/black jacket, black skinny jeans and black trainers. He was also carrying a rucksack. Detective inspector Eddie Ross said: "We would urge anyone who believes they may have seen this incident or anyone involved to let us know as soon as possible. "Similarly, if you were in the area on Saturday morning you may be able to help so please get in touch."